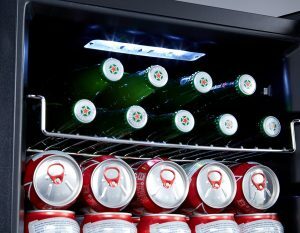 Kalamera KRC-70BV93 is the latest release 2018 model beverage fridge and beer cooler with a 93 standard can capacity and an efficient 95-watt compressor. It has a relatively low price tag for what it offers in terms of build quality, user-friendliness and cooling efficiency. It needs a stable ambient to operate and is designed for home use. With the adjustable thermostat and a temperature knob, you can adjust the cooling temperature between 32 and 50 degrees Fahrenheit. The ambient temperature is between 41 and 95 degrees Fahrenheit. So it offers quite a wide temperature range and you’ll be able to keep your drinks at their optimal temperatures and maintain the best taste and flavors possible. Black Kalamera Beverage Fridge weighs 47 pounds and measures 29.1 x 17.7 x 16.9 inches. It is compact in size but offers 68-liter internal storage space for up to 98 regular sized 12-ounce soda or beer cans. You can also put bottles or tall cans horizontally or by removing a shelf or two. It has a total of four solid chrome shelves that offer solid support to your cans or bottles. This compact yet flexible fridge runs without vibrations and quietly- making as little noise as possible. And you’ll not be disturbed by its noise in the same room while enjoying your drinks. It has the LED soft blue light at the top that makes the fridge look good and that lets you see your beverages without having to open the door and letting the air escape. Venting is both from the sides and the top for very efficient cooling. The glass on the door is double-paned for much better insulation to keep the cool interior temperature stable. The door is reversible and you can set it up to open from the left or right. The front legs are adjustable if you’re putting it on an uneven surface. Please note that the maximum number of cans you can fit in will depend on the size of cans and how you set up the shelves. The compressor has a 95-watt power (100-120 Volts and 60Hz frequency). The temperature is reported to mostly stay at what you set it to or a couple of degrees more. 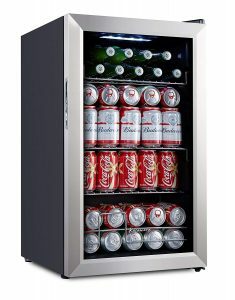 You can use it as an additional storage or cooling unit for your drinks and snacks, to the main fridge in your kitchen. By separating your beverage cans or bottles you’ll have more space left for your other fridge items. Kalamera Beverage Cooler holds the ETL certification, which means it conforms to the strict product safety standards in the US and Canada. It is offered with a year of parts warranty by the manufacturer.